Why list your yacht for sale with us? Why choose a Documentation/Titling Company? THE NEW WEBSITE IS NOW LAUNCHED!! We are proud to announce that BVI Yacht Sales Ltd. has a new website full of fantastic information and new features! 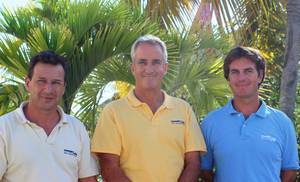 We can help make selling your boat in the BVI easy! So, you’ve decided to sell your boat… the little beauty is just a little small… you don’t get to use her enough… you have to stop cruising for a while… there are as many reasons are there are boats. But here you are in the Caribbean and you don’t want to do the long haul to take her back home, how can you find a brokerage that you can trust to come through for you? If you’ve been cruising in the Caribbean for a while, you will have realized that the marine community, on or offshore, is smaller than geography would predict. Word truly gets around on the coconut telegraph and if you tune in, you will probably find that BVI Yacht Sales will be recommended by a lot of people. Our brokers have helped a lot of people buy and sell their boats and we have a well-established reputation in the Caribbean. We are straightforward and will tell you what you need to know, give you advice based on current market conditions - we have access to a large ‘sold boats’ database as well as what is currently on the market. We not only know the boats we are selling very thoroughly but are usually current with what else is on the local market. We also know the best of the resources in the BVI and can put you in contact with the professionals who can help you prepare your boat for sale or take care of her in your absence. The important thing is, of course, that we get approximately 100 boats sold a year with three brokers. We advertise extensively on the Internet and work hard to keep them complete, attractive and up to date - real time. Nor do we ignore the printed word, we advertise not only through such major publications. YachtWorld.com – is a Broker MLS system and is the public’s largest used boat web site world wide. Countries include: North America, South America, Central America, Denmark, Germany, Spain, France, Italy, Netherlands, Norway, United Kingdom, Australia, Sweden, Russia and Finland. Boats.com - is a subsidiary to Yachtworld.com to gain more exposure with a different domain that comes up on search engines. Yachthub.com - Is a New Zealand based website. Boatsonline.com - Is a subsidiary to Yachthub.com which also allows for a more diversified demographic area and additional hits on search engines. All of our brokers are prompt and thorough when answering inquiries, demonstrating our sense of responsibility and helpfulness to the buyers and earning their trust, which is essential. Most of our centrally listed boats are located in the BVI enabling us take a complete photo shoot of the boat on digital camera. This has proven to be a very effective tool when presenting boats, not only in our Internet advertising but when emailing greater detail to distant buyers from all over the world. Every buyer who contacts us is very important to us so we work hard to make it happen and get our listed boats sold.